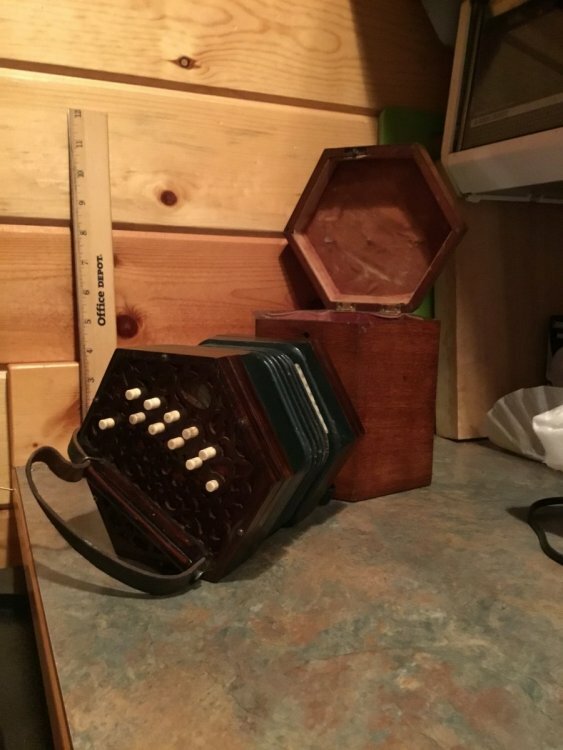 As a note of possible interest, I've come across a Lachenal 48 key that's small in the other dimension; It has only four bellows folds and fits snugly in it's original case. Is this common? 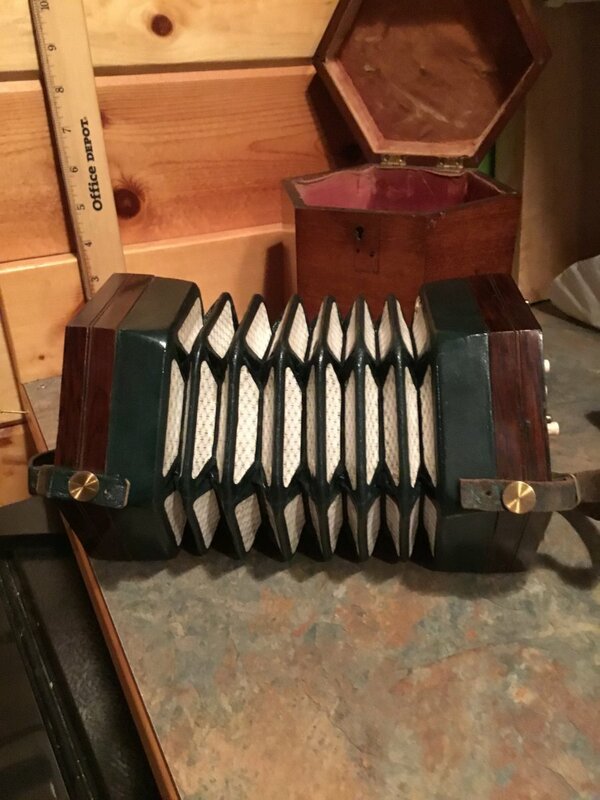 Lindsey I wish I could tell you something about it, other than it is precious and beautiful and I would love to hold and play it 😀 It is certainly a treasure, like mine, but difficult to get more information on. Would you be willing to take it apart very carefully and take pictures of the insides? And wouldn’t you know... I managed to get my hands on another one. This one a semi miniature in C/G in almost brand new shape. Recently I had Mark at Concertina Spares make me a set eight fold bellows for my 12k miniature, just to put this into context, this concertina is a top quality metal ended Wheatstone. It has been in my family since new so I wanted a a good job. As I said eight folds at a tiny 2.75 inches across the flats. The bellows are all black with leather panels and it fits in the same container as when the original bellows were made. A nice bit of workmanship. I think a large (comparatively) 4 inches across the flats would be straight forward for him. These bellows were made in the last 4 months or so. You can see that this is relevant information if you are thinking about new bellows for the mini-Anglo. I have a piccolo Lachenal, 20b in CG. 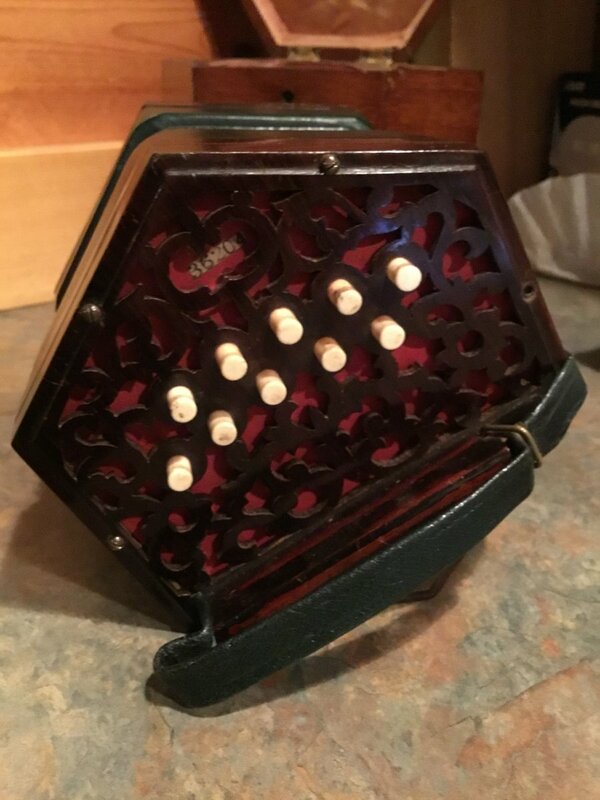 It's 5 inches across the flats, a lovely little thing, but very piercing in the higher part of the register, and the left hand has to be played sparingly or it can drown out the melody.